I laughed when Danny Trejo was suggested for a BTN. Fitting really as that's the reaction I usually have when he appears on screen. I wasn't however laughing when I looked at his list of credits. A character actor I knew he'd been in a lot of films but I had no idea just how many. Would that help or hurt was the question? I've been doing this long enough to know that the more movies an actor has done the more likely it is to swing violently to one extreme or the other. If an actor takes any role without discretion he's likely to end up like Trejo. With 54% negative over 46% he falls solidly in the bad column. Some might argue otherwise but that feels right to me. I've enjoyed him in some roles where it calls for a little camp but mostly he's synonymous with bad to me. Thanks to Powdered Toast Man for this week's pick! Also it's his birthday today so make sure you stop by his blog and wish him well. 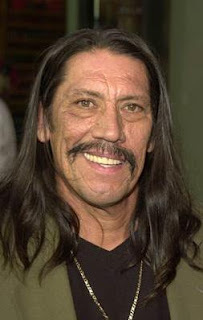 Hehe I bet he suggested this Actor because when He and I play his Movie game Danny Trejo is used alot to make connections. hehe Great By the numbers I usually enjoy his campy parts as well too bad for him all those so so or worse parts tanked him in this. This is the first time I have issues with this feature. Danny clawed himself up from playing bad guys in bad movies - his look doesn't lend to leading man roles. But he was always solid and many times the best thing in those bad movies. I hope he becomes a grubby action hero with his 'Machete' movie and it's possible sequels - 'Machete vs The Moon Maidens' and 'RoboMachete on Mars'. Nippy, I really expected him to do better. Sad thing is that I was actually more generous than a lot of other people as I did like some of the camp too. Cal, You're wrong on this one, when you look at his credits and you get to a couple years ago and realize there's still 50 films still to go through... that he did in 2 years... trust me on this, he spread himself around too generously late in his career and most of it has been bad. The dude's also sixty-six - that's amazing! Wonder where "Machette" will end up on that graph? He's definitely awesome. I smile whenever I see him in anything. No opinion on this one...I always thought he was an Indian. Ha ha! Funny suggestion. I want to know about Billy Bob. Danny is definitely one of those actors whose face you recognize, but his name? Not so much. Incidentally, I follow the hilarious freak Gary Busey on Twitter and Gary frequently retweets Danny's messages. So there's that. hmmm... that is kind of surprising. like bev said, he's someone who's face you know, but name you don't (although i have a personal rule that if ive seen someone in 5+ things -including tv- then i need to find out their name). but on the whole, i think id agree with you here. That's a shame for Danny. He was hoping for a good review. I will have to tell him the bad news at my bday party at Chucke Cheese. Thanks for the shout out and using my pick. Keep Danny out of the ball pit PTM. I hear that catching plague is something that really get's him upset. His roles have everything to do with his "Character" and nothing to do with him being an "Actor." Dude, I'm totally stumped, who is this guy? Now, while the majority of his films may be bunk, if that pie chart were for "Amount of awesomeness Danny Trejo brings to each of the films he is is", you betta believe itd be 100% YES.. Even though Yes wouldnt necessarily make sense.. Still.. Still..